In an America generations removed from the greatest civil rights struggles of the 1960s, the young mayor (Oscar Isaac) of Yonkers, New York, is faced with a federal court order that says he must build a small number of low-income housing units in the white neighborhoods of his town. His attempt to do so tears the entire city apart, paralyzes the municipal government and, ultimately, destroys the mayor and his political future. 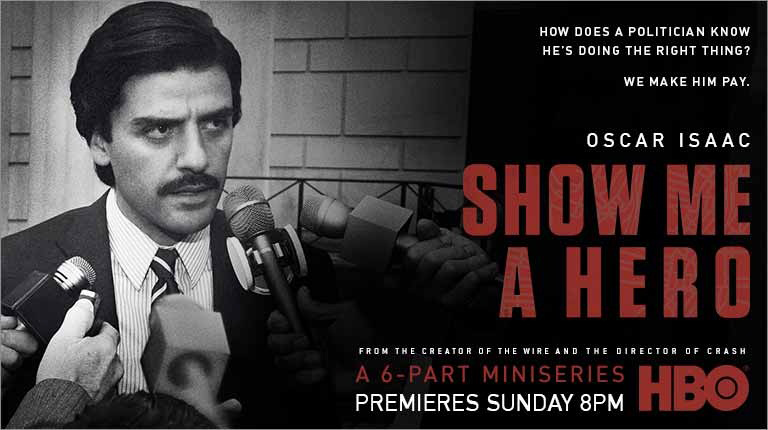 From creator David Simon (The Wire) and director Paul Haggis (Crash), and based on the nonfiction book of the same name by Lisa Belkin, this six-part miniseries explores notions of home, race and community through the lives of elected officials, bureaucrats, activists and ordinary citizens. Co-starring Catherine Keener, Alfred Molina, Bob Balaban, Peter Riegert, LaTanya Richardson-Jackson, Carla Quevedo, Jon Bernthal and Winona Ryder. "Show Me a Hero" is currently on digital retailers like iTunes, Amazon, Google Play and Vudu.